this is what happens when you announce vaporware. this is also what happens when a manufacturer relies on the distributor to advertise their product. end result, declining sales and mindshare. palm needs to put out the pre 2 yesterday and create mindshare with an advertising blitz that will dovetail into whatever they have planned for ces and future webos hardware. right now no one will buy a webos phone unless they are doing so to replace one they have or to keep as a backup. Pre 2 may as well be vaporware in the US, if they can’t identify a release date by now they might as well just not release it in the states and just wait and release what they have in the works as soon as possible. Well, that, and they aren’t doing any Palm advertising whatsoever… People don’t buy what they don’t know about. +1 Just get over that dependence on the carriers already. It’s an old (and american) mindset that’s not working anymore. The carriers need to be on track of course but they are not the best advertisers. Verizon screwed Palm from day 1 by continuing to feature the droids until this day. Now we are faced with a combo of VZW overscrutiny to hobble things and a changeover in who is advocating for Palm. In a way, HPalm has to stay with VZW as the “biggest and best” but if VZW is smart, they will embrace and advocate the Pre2/PalmTab because they feature the best OS despite the worst marketing. If the power of HP floods the market with well priced WebOS2 phones and Tabs, watch out. WebOS is well developed and has a great base of open access affectionados and could go from nothing to at least a small player quickly. As I advocated elsewhere, providing a good solution for bluetooth voice dialing would immediately get the recognition of safety advocates if HPalm plays it right. And I saw a commercial for Kindle that mentioned most except Palm, get on the stick HP. BTW, fifth generation Palm phone user including the foray into WM6 on a 700WX. But immediately bought a VZW Pre when available. Recent dissatisfaction about no word on BTVD or Pre2 caused me to explore most available. There is no better OS! I can understand waiting for CES on one hand, others will make a splash there also, but to not keep some dollars in peoples pockets during holiday season with a finite promise is a big mistake. HP did not purchase Palm to replicate their slowness, but to move, yes move, into other areas. The PalmTab is really what they were interested in but it will be more successful with good phones. Also, from that graph, apparently Palm was doing as well as HTC all through the summer. So it hasn’t exactly been the NILL as the doomsayers report. HP didn’t buy Palm for short term gain. I’m sure webOS devices will be abundant in 2011. It’s better to bring out great products later than non killer products early. History has shown market leaders can lose its position very quickly due to disruptive technology advancement. HTC had a tough time keeping the Droid Incredible in stock. It’s not a matter of beating or keeping up with HTC. You have to look at it as webOS vs Android. Plus, the Verizon Palm Pre Plus was free with a free mobile hotspot. Pricing definitely helped Palm. The Palm chart declined when Samsung joined the fray. It just speaks the amount of competition. Droid Incredible, Droid 2, Droid Pro, Droid, Fascinate, Continuum. Did I miss any? 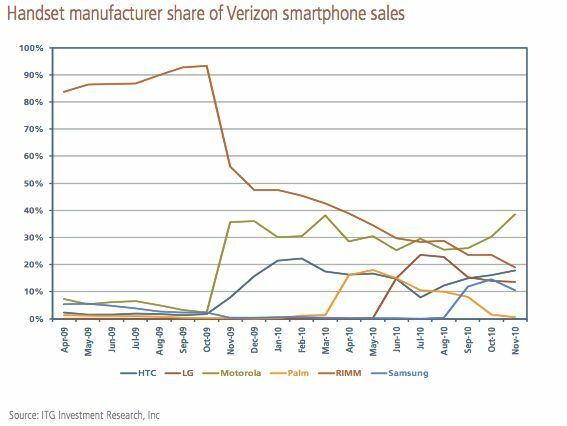 It’s going to get even more crowded when Windows Phone 7 is released on Verizon in January. This is ridiculous that they can’t even annouice a real Verizon release date for the Pre 2 or for webOS 2 for my Palm Pre Plus. I got apps I need to get working for my job, especially VPN. I spent a half an hour arguing with someone from HP/Palm on why they need to tell people the real poop. Verizon doesn’t care – they would be just as happy to put me in a Droid. In the Pre is going to have real future they need to be honest and upfront with their existing customers, and then start marketing the crap out of their phone so we can have some apps. Come on guys! I’ve got about a month before I give up on them if they don’t do some announcements soon.